In the heart of Primrose Hill and a short walk from Chalk Farm tube station, PHBC offers a friendly, warm environment in which you can run your business, be it established or start-up. We provide office accommodation for a minimum of six months to as long as you want, without the worry of maintenance, repairs, cleaning, and business or water rates. We will answer the phone for you, manage couriers and parcel deliveries, and welcome your visitors. We take care of everything, at inclusive rates that are far below the cost of providing yourself with the same facilities - and the lowest in the Primrose Hill / Camden area. 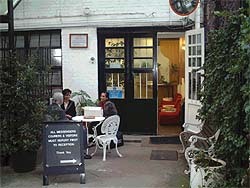 The premises are in two buildings, which overlook an attractive garden courtyard. There is both office/studio and storage space in units ranging from 100 - 600 sq ft. Copyright © 2010 Primrose Hill Business Centre. All Rights Reserved.